Product categories of Outdoor Furniture, we are specialized manufacturers from China, Outdoor Furniture, Outdoor Rattan Furniture suppliers/factory, wholesale high-quality products of Outdoor Metal Furniture R & D and manufacturing, we have the perfect after-sales service and technical support. Look forward to your cooperation! When you have outdoor area at your living space, it is worthy if you adorn it with functional and beautiful decoration. You could beautify with plantations like pots of flowers, vegetables, herbs, and trees for green scenery and natural atmosphere. For the decorations, outdoor furniture and other garden accessories are the right answers for outdoor comfort. In term of Outdoor Furniture, it is classified as the main point that homeowners have to place in the outdoor setting, in any outdoor setting such as lawn, garden, patios, decking, or terraces, they are wonderful and functional for the need of outdoorliving, dining or even bedroom. such as teak, wrought iron, plastic, rattan, synthetic fiber, stainless steel and many more. Among those materials, it is important that you select the right one, in term of design as well, tailored to your budget. After you have made a decision on the material, the next will be type of garden furniture. This is major, as it is the one that affect the overall appearance of your outdoor space. For limited space, a bench added with a size table would be perfect for your sipping a cup of tea every morning. 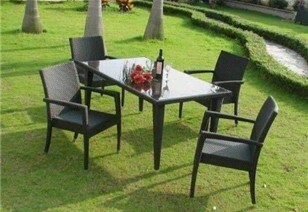 For big size of space, 4-6 seater dining set accommodates the need of outdoor ding or party time. After the instances, now you could use your outdoor for your favorite activities at home.